TuneClone M4P Converter is an easy to use software tool that converts M4P to MP3, M4P to WAV, M4P to WMA with the help of the automatically generated virtual CD drive. Generally speaking, when you purchase music from iTunes Store, it comes with a copyright protection called DRM (short for Digital Rights Management). These DRM-protected songs are locked so that they only work with Apple MP3 players. That means that if you bought a BlackBerry Storm, you cannot use iTunes music. So, what is the solution? You have to burn a CD. When you do this, the DRM is removed (because the music is converted to a non-DRM-compatible media). After you burn the CD, you can rip it to your PC as an MP3 file which no longer has DRM. Alternatively, you can use TuneClone M4P Converter. TuneClone M4P Converter makes a virtual CD drive, tricking your PC into believing that you are burning a CD. Therefore, the DRM is removed without wasting a CD. TuneClone M4P Converter is the software you are looking for if you have a big collection of iTunes music files to be converted to MP3, WAV or WMA for your Zune, PSP, BlackBerry, Mobile Phone and a lot more mobile music players. TuneClone M4P Converter applies the virtual CD burning technology to simulate the burning and ripping process. 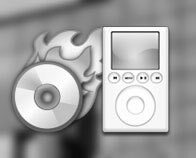 You just need to burn the iTunes M4P playlist to TuneClone virtual CD burner and TuneClone M4P Converter will directly convert M4P music files to MP3, WAV or WMA. It is very fast and the ID3 tags information about each music song will be preserved perfectly. TuneClone M4P Converter lets you remove DRM protection from purchased music files within a few clicks by applying the virtual CD burning technology. You can play the converted DRM removed music files with Media Player software or any MP3 players including Zune, PSP, BlackBerry, Creative Zen, iriver, etc. Compared with using real CD-R or CD-RW disc, TuneClone's virtual CD burning can use the maximum writing speed and your music files can be converted at a very high speed. TuneClone M4P Converter works great for batch converting music collections. TuneClone M4P Converter supports almost all music file formats that your media player software can play and burn, no matter they are DRM protected or not, including WMA, M4P, AAC, MP3, WAV, etc. TuneClone M4P Converter can convert music files to MP3, WAV and WAV format. TuneClone M4P Converter is easy to install and use with a very handy and clear user interface. TuneClone M4P Converter well preserves ID3 tags for artist, album, title names, artworks, etc. How to transfer iTunes music to PSP? How to import iTunes music to Windows Movie Maker? How to play M4P on BlackBerry Storm? How to put iTunes music onto Zune? How to convert iTunes Plus to MP3? How to remove DRM from iTunes music on Windows and Mac? How to free create custom ringtones for iPhone 3G using iTunes?